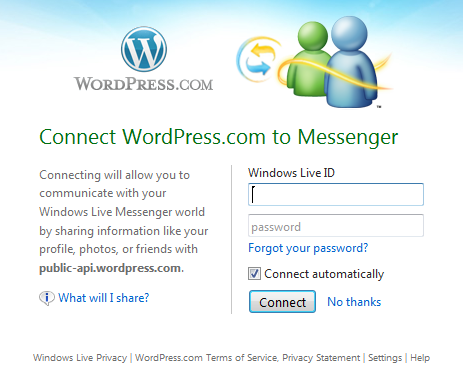 Talked around in the announcement that Windows Live Spaces will be migrated to WordPress.com is that Windows Live will now create WordPress blogs. 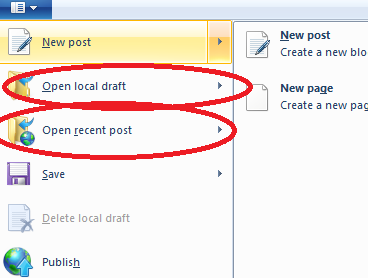 This is of course being done via Windows Live Writer. This has been a super exciting announcement for the Live Writer team. WordPress is a quality blogging server that has been nothing but helpful to the Live Writer team over the years and we really are looking forward to a great partnership moving forward. There is a lot of functionality that WordPress.com has that the Spaces team could have never gotten to and to be able to bring this to y’all is really exciting. 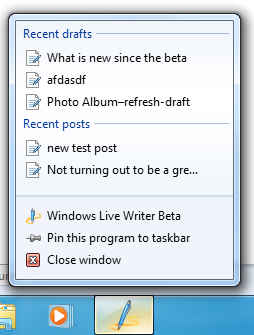 Here is a preview of what this looks like in Windows Live Writer 2011. 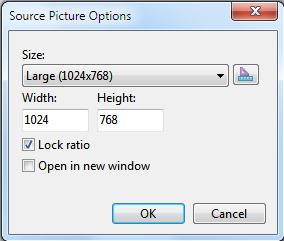 I should note that you cannot find this functionality in the Beta releases of 2011. This was turned on post Beta builds. 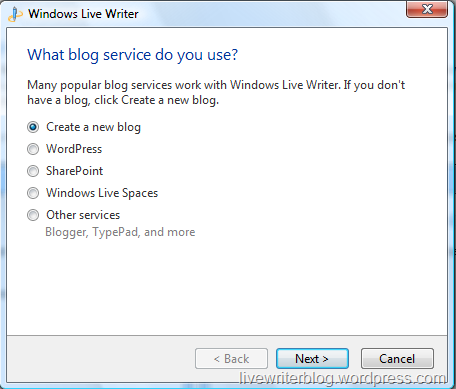 In Live Writer 2009 the option to create a new blog created a blog on Spaces for you. Here are the first two steps of that sign-up/configure process. 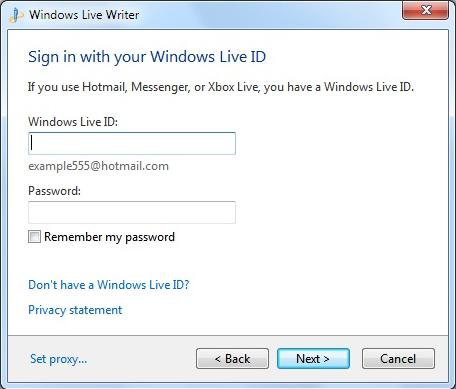 From here you could create a Windows Live ID if you did not have one and then you would have a Space created for you. 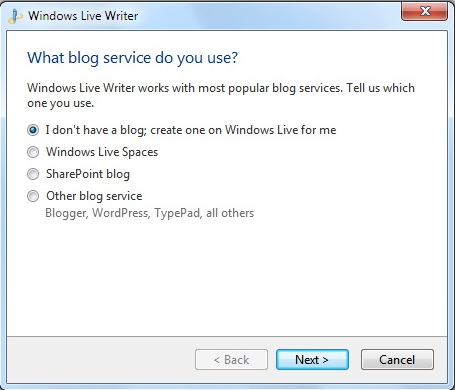 Here is the Live Writer 2011 sign-up/configure process. As you can see creating a new blog via the first option will take you through a process that will create and configure a blog on WordPress.Com. If you already have a WordPress account then of course you would pick the second option where as in Writer 2009 you would have picked the last option, “Other services”. 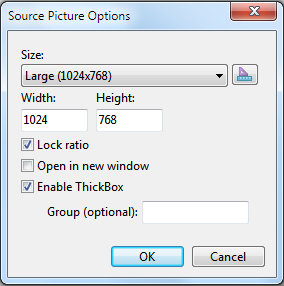 The second image is if you click Next with “Create a new blog” selected. If in the second step you click on the WordPress link you will see something like this. Clicking on the Connect button takes you to this page. Here you can associate your Live ID with the new WordPress account you are going to create. After this step it is the standard sign-up process for a WordPress.com blog. 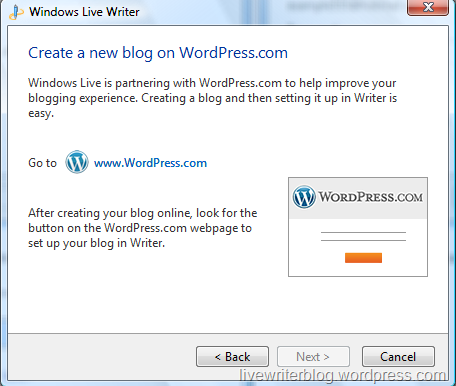 You then receive a confirmation email and if you are still in your sign-up flow in the browser you will see a link to bring you back into Live Writer to help you configure Live Writer to use that newly created blog. I have to admit that as someone born and raised in the Seattle area that 90’s grunge is my music of choice. The guys and gals in those band are roughly the same age as I am and I would see them in the Seattle bars/clubs but at the time but I am also a fan of jazz music. WordPress has used code names that tied to jazz artists and for WordPress 3.0 it was Thelonious. In Matt’s keynote at WordCampSF this year he used jazz album covers throughout the presentation which was fun to see. WordPress 3.0 was released today. Congratulations to all of my friends at Automattic and the whole WordPress team! You can find their whole change list for 3.0 here. I wonder how quickly we can add funnyordie.com support to Live Writer?